I love making custom plush. 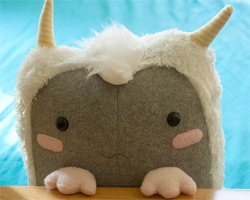 If there's something that you'd like to own in huggable form, send me an email and we'll start the process of making something awesome together. How do I start? Email me describing what you have in mind. Pictures are a big help. If you have a preference for fabrics or colors, let me know that as well. Pricing? I will determine what materials I will need, and how much time it will take for me to make your plush. Don't worry about that yet - we'll figure it out once we sort out the project details. Here's what past customers have to say. It is awesome! ... 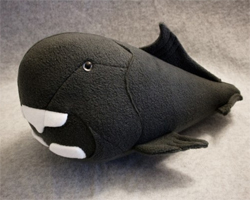 Thank you SO much for saving my faith in the internet (years of typing in "stuffed dunkleosteus" and getting nothing...) And for making such an incredible, cute and cuddly yet still formidable likeness of her favorite fossil ever! Haha, she loves him! It was a total surprise! It's wonderful! Thank you so much again, it's been so great! 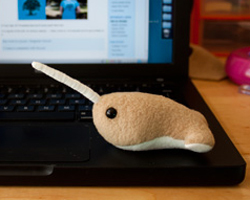 We just got the narwhal today! It's absolutely adorable :) We can't wait to travel the globe with this cute little guy! !